Mold commonly develops on home insulation as the result of a leak in the roof, water from a leaking pipe or from water that's come in contact with the insulation during a flood. Moldy insulation poses a serious risk to a family's health, as mold can cause serious respiratory problems and chronic illness. The moldy home insulation must be removed with extreme care. Begin by dressing in a shirt with long sleeves and pants, which will protect the skin from coming in direct contact with the moldy insulation. Put on a pair of heavy-duty rubber gloves that extend midway up the lower arm. Apply tape around the arm at the point where the gloves end to prevent insulation fibers from coming in contact with skin. Don a half-face respirator. Low-quality paper face masks are not suitable for this task, as fine mold spores can penetrate around the edges of the mask. Inhaling these mold spores can cause chronic respiratory problems. It's vital that a high-quality respirator is used for this task. See the Resources section. Place drop cloths on the floor, extending from the site of the moldy insulation to the nearest exit to the outdoors. If the moldy insulation is located in a wall, the sheet rock will first need to be removed, placed in contractor bags and immediately brought outdoors. The mold spores will have spread to the sheet rock. It must be removed to prevent the return of mold. Remove the insulation by rolling it up as it's pulled out of its resting place. Once the entire piece of insulation is rolled up, it should be immediately placed into a contractor bag. Once the moldy insulation is removed and bagged, the bags must be brought outdoors immediately to prevent exposure to mold spores and the possible spread of the mold. When bringing the bags outdoors, use the shortest possible route to the outdoors and avoid carpeting. Pull up the drop cloths and immediately dispose of these items. 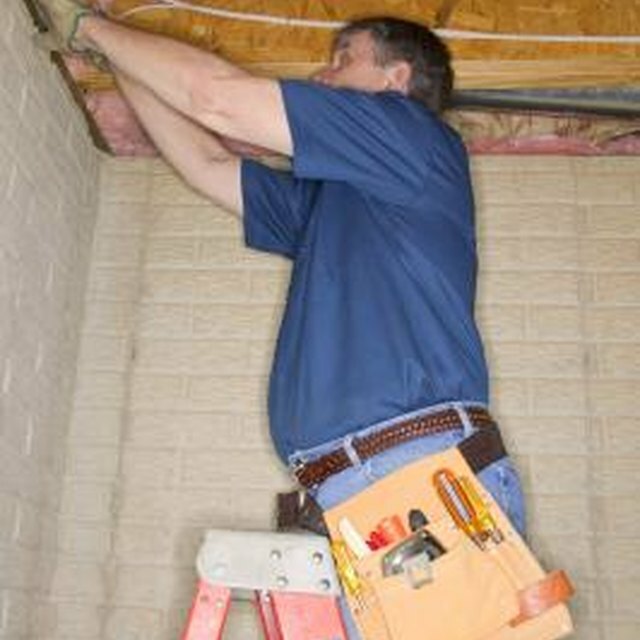 Once the moldy insulation is removed from the structure, immediately remove clothing and shoes. Launder these items immediately using detergent and a color-safe bleach. Dispose of the gloves. The source of the moisture that caused the mold must be identified before new insulation is installed to prevent the return of mold. If anyone in the household begins to experience unexplained illness or respiratory problems, it's possible that this could be the result of exposure to mold -- a fact that should be mentioned to the physician who is treating the illness. Seek immediate medical attention.